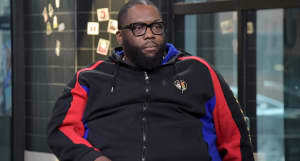 NRATV has released the full version of Killer Mike's controversial interview, which the Run The Jewels rapper pointed towards on his Instagram and Twitter on Wednesday. On Saturday, a segment from the interview, which was filmed on March 18, was met with backlash after it showed Killer Mike defending gun laws as they stand in the wake of the March For Our Lives, which called for large-scale change in gun legislation. In the full interview, titled on their website as "The March for Less Freedom," he expands on his ideas on gun ownership as it pertains to war, tyranny, and the history of oppression in America. While that may or may not be fully accurate — soda actually has seen a major overhaul in its regulation in the last several years, with New York leading the way in reworking its perception in American public health — Killer Mike maintains that people should get to know the NRA better before critiquing. Thumbnail courtesy of Emma McIntyre/Getty Images for FYF.